Grimspound is a late Bronze Age settlement, situated on Dartmoor in Devon, England. It consists of a set of 24 hut circles surrounded by a low stone wall. The name was first recorded by the Reverend Richard Polwhele in 1797; it was probably derived from the Anglo-Saxon god of war, Grim (more commonly known as Woden, or Odin). In 1893 an archaeological dig was carried out by the Dartmoor Exploration Committee, which recorded many details of Grimspound as well as, controversially, making a reconstruction of the site. The site was first settled in about 1300 BC. The 24 hut circles are surrounded by a massive granite perimeter wall, which may have stood at 1.7 metres in places. The roundhouses, with an average diameter of 3.4 metres, were each built of a double ring of granite slabs with a rubble infill, a technique still used in dry-stone walling. Hut 3 has a surviving porchway, with the two jamb stones still upright, although the lintel has fallen. There is evidence of human activity: artefacts include pottery, scrapers and pot boilers. Organic remains such as wood and textiles have not survived owing to the acid nature of the soil. 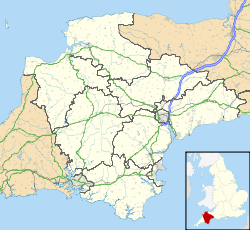 The name Grimspound was first recorded by the Reverend Polwhele in his History of Devon of 1797. He called it "The seat of judicature" for the River Dart area, and also surmised that it was "one of the principal temples of the Druids. Other ideas about Grimspound include supposed uses as an Iron Age fort, an encampment for tin miners and even a Phoenician settlement. Grimspound was first mapped by A. C. Shillibear in 1829. An 1855 plan by Nick Whitely shows hut circles outlying the perimeter wall, unrecorded elsewhere. In 1893 the Dartmoor Exploration Committee began a dig at the site. The dig, one of whose members was the Reverend Sabine Baring-Gould, reconstructed some of the site, a move criticised by some of the Committee at the time and also by later researchers, including R. Hansford Worth. Grimspound is located in the valley between Hameldown Tor and Hookney Tor, at 450 metres above sea level. The nearest village, Widecombe-in-the-Moor, is a few miles to the south. The site is enclosed by a stone wall, interrupted by a large, paved entrance facing south, uphill towards Hameldown. The wall would have been substantial – in some places its ruins are more than 15 feet (4.5 m) in thickness. However, the site is of limited value from a defensive point of view, so the assumption is that the wall was to keep livestock in, and predators out. It is possible that it was topped by a hedge or fence. On the northern edge of the site is the start of the West Webburn, which was the main water source for the settlement. The entrance is described as "the most imposing of all" by Jeremy Butler. It is a paved and stepped corridor 5.5 metres long and almost 2 metres wide, with megaliths and other large stones forming the sides. Butler states that it was not designed to exclude livestock. Excavations at other sites on Dartmoor have shown that such walls were probably built by small teams of men working simultaneously on a section each, as shown by differences in building style; some evidence of this is visible here. However, these may simply be due to the reconstruction work by the 1894 excavation (see below). Twenty-four stone hut circles have been officially recorded here, although there are probably remains of more within the enclosure, which has an area of over 16,000 square metres (four acres). Many of these hut circles feature L-shaped porches. The doorways are paved with naturally flat stones, and all face both downhill and away from the prevailing wind. The 1894 excavation reported that the huts nearest the entrance (save for Hut 12) were devoid of signs of human habitation, and were therefore used for livestock or storage, as was hut 2 at the opposite side of the compound. The huts range between 9 and 15 feet (2.7–4.5 metres) in diameter, with walls about 3 feet (1 metre) thick, made of upright granite slabs packed with an infill of rubble and possibly peat. Excavations at sites such as Holne Moor have shown that such huts had an interior plank lining. The hearth was variously located at the centre of the hut, or opposite the door. Ash from the hearths was found to be from oak and willow twigs. A lack of log remains and the presence of peat ash shows that by the time of Grimspound's occupation, the local forests had been replaced by enough peat buildup for it to be cut for fuel. Cooking holes contained granite pot boilers, pieces of stone heated in the fire and dropped into pots of water sunk into the ground (the pottery of the time not being fireproof). To the right of each hut entrance is a raised, level area, which the Committee called a "dais" and which was probably the sleeping area. Four of the huts (3, 7, 17 and 18) contain raised or upright stones, described as "anvil" stones, the purpose of which is unknown. Unlike many similar sites on Dartmoor, there is no obviously larger hut that can be identified as a headman's dwelling, although the Committee did suggest that a pillar outside Hut 19 could have meant that the headman lived there. The acidic soil of Dartmoor has destroyed nearly all organic material; it is therefore difficult to tell what Grimspound must have been like during its occupation. A flint arrowhead found nearby, and the lack of querns for grinding cereals, hint at some dependency on goods from outside the area (flint is not local to Dartmoor). The Exploration Committee also declared that the clay used in pottery fragments did not come from a local source. ^ a b Chapman, 8. Chapman, L. (1996). The Ancient Dwellings of Grimspound & Hound Tor. Newton Abbot: Orchard Publications. Worth, R. N. (1967). Spooner, G. M.; Russell, F. S., eds. Worth's Dartmoor. Newton Abbot: David & Charles. ISBN 0715351486. Wikimedia Commons has media related to Grimspound. This page was last edited on 8 March 2019, at 02:41 (UTC).